"O Mary Magdalene, you, whose sins divine grace washed in full, intercede with Jesus Christ on our behalf, so that, with pardon given, He may lead us out of this wretchedness into eternal joy." This medieval text sums up the role of Mary Magdalene in the Christian Church of the Middle Ages. She was one of the women who followed Christ and served him with their possessions. She also witnessed Jesus's crucifixion and his resurrection. In particular the crucial role of Mary Magdalene on Easter morning, looking for the body of Jesus, meeting him as the resurrected and ordered by him to report his resurrection to his disciples, gave her a central role in the Christian Church. As so often with biblical characters worshipped as saints, a whole web of myths was woven around her. Very little of her is known from the gospels. The facts, which are told, were used to create a picture of a sinful woman, saved by Christ, and therefore ideally suited to model the Church and the (sinful) believers. According to the Bible, seven devils were driven from her. These devils were associated with specific sins. And Pope Gregory the Great, in the late 6th century, associated her with the 'sinful woman' from Luke 7, who washed Jesus's feet, and also with Mary, the sister of Martha and Lazarus. One of the sins associated with her - probably referring to the woman Luke reports about - is prostitution. As a repentant sinner, seeking forgiveness from Jesus and being forgiven by him, she was the ideal role model for the Church: "Let us praise the Lord, O Magdalene, bride of Jesus Christ and our patron, you, the model of repentance and mirror of the church", as another medieval text puts it. Being originally peccatrix (sinner), meretrix (prostitute), she became dilectrix Christi (lover of Christ) or even – in a typical medieval metaphor - sposa Iesu Christi (bride of Jesus Christ). And she was asked for intervention on behalf of the sinners, and even was hailed as blessed woman who was able to "dissolve all our sins". The present disc shows that in the 17th century Mary Magdalene still played a major role in religious life. Whereas in previous centuries the various aspects of her life - whether taken from the Bible or fictitious - were displayed in polyphony and melismatic lines, the modern declamatory and theatrical style of the 17th century, as developed in Italy in the early 17th century, allowed for a more vivid exposure of her life. The programme is divided into two sections, which are devoted to two aspects: Magdalene as a model of the sinner on the one hand and in her role as witness of the death and burial of Christ on the other. The first piece, La Maddalena, is a drama in five acts that was written by Giovanni Battista Andreini, a dramatist and actor who was active at the courts of Florence and Mantua. It was first performed in Mantua in 1617, probably at the occasion of the marriage of Ferdinand Gonzaga and Caterina de' Medici. Andreini called it a sacra rappresentazione which at the time was the name given to a religious play in the Italian language. The play included some musical intermezzi; these were separately published in the same year by Bartholomeo Magni in Venice. In his liner-notes Jérôme Lejeune suggests that even more music may have been performed during the event. Despite its sacred content, the performance was staged and costumed, which indicates that it made use of the means of secular music. The prologue is Su le penne de' venti by Monteverdi. It is a strophic piece for solo voice, with instruments playing the ritornelli between the stanzas. The soloist represents Divine Favour who is disguised as Cupid and urges the audience to use Magdalene's repentance as a model. The two composers of the next three pieces are largely unknown. From 1615 to 1619 Muzio Effrem was at the service of the court in Mantua and then worked for three years in Florence. Alessandro Guivizzani (or Ghivizzani) worked in Mantua from 1613 to 1620. Their contributions dwell on the tears shed as part of the repentence; a trio of male voices represents David, Saul and an angel. The fourth piece ends with a choir of angels: "Go then, change your life, like the sinning Magdalene". This piece is the fourth in this sequence but in the play it is the last intermezzo. Here the cycle closes with Spazziam pront'ò vecchiarelle by Salomone Rossi. It is placed at the end "for musical reasons", as Achten writes. It has the form of a villanella, which is one of the lighter genres of secular music at the time. "[Its] popular cut provides a perfect description of the lightness of the Magdalene's morals before her conversion". Mary Magdalene followed Jesus until the very end. She not only witnessed his death and burial, but was also the first who met Jesus in person after his resurrection. 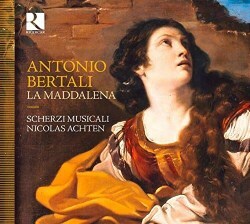 This latter aspect is omitted in La Maddalena by Antonio Bertali. That is only logical, as this work is a so-called sepolcro, "a 17th-century genre of sacred dramatic music in Italian, related to the oratorio and performed on Maundy Thursday and Good Friday at the Habsburg court chapels in Vienna" (New Grove). The first sepolcri date from the 1640s and this tradition lasted until the early 18th century. La Maddalena was first performed in 1663 when Bertali was Kapellmeister. The performances were at least partly staged. "As was customary, the sepolcro began with an instrumental Sinfonia. Various accounts of performances of these works state that a curtain was placed in front of the depiction of the sepulchre and that this was raised at the start of the performance whilst the instrumental introduction was being played" (Lejeune). La Maddalena is divided into three parts. In the first we meet two characters: Amor verso Dio (love for God) and Pentimento (Repentence). They are appropriately scored for an alto (here sung by a high tenor) and a low bass respectively. Before Christ's tomb they lament his death. Then the attention turns to the Virgin Mary (mezzo-soprano) and Mary Magdalene (soprano). They want either Jesus to return to them or to die. This section includes a piece, which is an early form of an aria. In the last part the two women are joined by two Peccatori (Sinners), scored for tenor and baritone respectively. They realise that their sufferings will be eternal. Bertali prescribes the use of muted cornetts here which contributes to the gloomy character of this episode. It then is Mary Magdalene, who urges them to repent and she is joined by the Virgin Mary. Together they express the moral of the piece: "If you should nourish your vain and unhealthy desires with hope, then know, o mortal, that at the end you will find Penitence, terror, the grave and worms". Two further pieces are added to the programme. The sacra rappresentazione is followed by an instrumental piece by Bertali. The Sonata 3 à 3 is an air with variations and was originally scored for violin, viola, viola da gamba and bc. Here is it played with various instruments, which are also used in the two large works on this disc. The programme closes with Lagrime amare by Domenico Mazzocchi, which was published in 1638 in Rome, where the composer also also worked. From that angle it doesn't quite fit into the programme, but its content certainly does. It is a lament as so many were written at the time on secular and sacred subjects. This piece is about Jesus's crucifixion and includes strong chromaticism and some very unusual modulations. Interesting is that, according to Achten, it has an ornament which requires an "imperceptible transition from one note to another", a kind of glissando. This production is the result of a project, which required a lot of research, in regard to the music itself, but also to performance practice. Especially notable is the large group of continuo instruments, which are divided into three instrumental families. It includes some especially large theorbos but also a tiorbino, which is an octave higher than the theorbo. The keyboard instruments are a Roman harpsichord with three split keys per octave and a virginal with gut strings. Achten also splits the ensemble into a group of lower instruments, responsible for the bass and the harmony, and a section of higher pitched instruments, which realises the harmony with added ornamentation. Thanks to the quarter comma meantone temperament, the use of harmony for expressive reasons comes off to maximum effect. From a musicological point of view, this recording is an unequivocal success. Fortunately, this is by far not just a musicological project. We get very vivid and highly expressive interpretations. Deborah Cachet is impressive as Mary Magdalene in Bertali's sepolcro; the other singers are just as good and the ensemble of two and three voices in Bertali is impeccable. Nicolas Achten sings the Monteverdi solo and does so very well, with some exquisite and stylish ornamentation. It is the text and the affetti which are always in the centre here and as a result the emotions of the various characters are incisively communicated. The ensemble produces a gorgeous sound and one can only enjoy and admire the colours of the various instruments and the skills of those who play them. Let's not forget the music. It is astonishing how much music of excellent quality was produced at the time, in Italy but also at the imperial court in Vienna. This disc shows that there is still much to be discovered. The value of this disc is in the repertoire and in the way it is performed here. Therefore the label Recording of the Month is well deserved.